Ludhiana: The cause of Sikh political prisoners jailed in India despite having served their minimum mandatory jail terms remains in focus amongst Sikh circles. Struggle to secure release of these Sikh prisoners continues in one form or the other. Punjab CM Parkash Singh Badal is repeatedly maintaining that the Punjab government was in favour of release of these prisoners, but it was the Central government of India that possesses authority to release these Sikh prisoners. Punjab govt. says it has written letters to the Centre seeking release of concerned Sikh political prisoners. On the contrary, Punjab DGP and ‘blue-eyed’ boy of Parkash Singh Badal, Sumedh Saini, opposes release of Sikh Political Prisoners. Information related cases for premature release of these Sikh political prisoners is complex involving technical, political and judicial aspects. Detailed discussion about case for premature release of Bhai Subegh Singh would through sufficient light to expose the role of Punjab government. Bhai Subegh Singh s/o Sewa Singh of village Suhron, (Police station Khedi Gandiaan) of district Patiala was charged under sections 302, 380, 392, 120B in a case FIR no. 22 dated 13-02-1995 registered at Police Station of East Chandigarh. 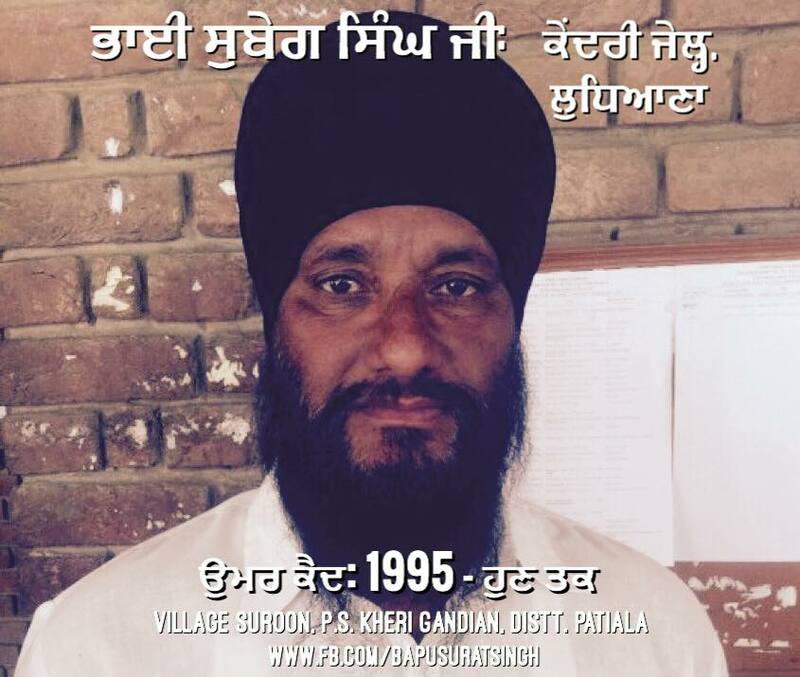 He is imprisoned at Central Jail, Ludhiana since 1995. Subegh Singh regularly availed paroles after being convicted to imprisonment for life in this case. The success of his case for premature release by Chandigarh Administration depends on the reports of SSP and Deputy Commissioner of Patiala. But the Punjab Government didn’t recommend his release and even opposed his release in response to a petition moved by Subegh Singh in Punjab and Haryana High Court. High Court judge Ajay Tiwari had ordered the Government to reconsider Subegh Singh’s case for premature release within two months. In response to the High court’s directions, the Deputy Commissioner of Patiala opposed the premature release of Subegh Singh. ‘Neither village residents nor the Panchayat members are in favour of premature release of Subegh Singh. Prisoner Subegh Singh remained quite active during militancy period. This criminal minded person is very clever and holds potential of committing crimes again and again. He can rejoin his friends to promote terrorism after his release and can commit serious crimes. His premature release can lead to the law and order problems in the state. For this reason the local police is not in favour of his premature release. Agreeing the report of local police, Senior Supretendent Police of Patiala has also opposed the premature release of Subegh Singh s/o Sewa Singh on the basis of mercy’. It is worth mentioning that Subegh Singh is one of the 13 Sikh political prisoners about whose premature release was demanded from the Central government of India by Punjab CM Parkash Singh Badal. As Subegh Singh has already attended 23 paroles of 42 days, denial of Patiala Administration from recommending his premature release indicates that Badal Government holds is based against premature release of these prisoners. It is notable that leave on parole is always sanctioned after getting written recommendation from Panchayat and filling bail bond. Claims of Patiala Administration about the village leaders do not favour premature release of Subegh Singh were totally false as written recommendation from Panchayat about his premature release was also sent by Jail administration. This written recommendation from Panchayat consist signature of Sarpach Gurmeet Kaur along with other Panchayat members and village residents. Now, the question arises that why Patiala Administration or the district Police said that village panchayat was against release of Subegh Singh? I can only say Badal Dal and his family; Punjab Government, Punjab Police and the civil Administration are biased against the release of Sikh political prisoners. Expecting recommendation for premature release of Sikh political prisoners from Punjab Government is like expecting milk from a bull.